The Dwarven Horse is a unique horse which can be constructed as part of the related quest. 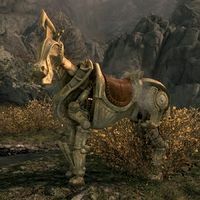 It is a vamidium, a Dwarven automaton built to resemble a living horse for use as a mount. The parts needed to build it can be found within Runoff Caverns. It is unique in that it takes no damage; it cannot be hit, can fall from any height, and cannot even be killed through use of the kill console command. One of the side effects of this is that you are rendered invincible while mounted, making mounted combat quite useful. The Dwarven Horse: Reassemble an ancient Dwarven vamidium. Despite being mechanical, it makes regular horse sound effects. Dwarven Horses first appeared in ESO. This page was last modified on 16 April 2019, at 15:32.